All photos by Allan Lissner. More available here. 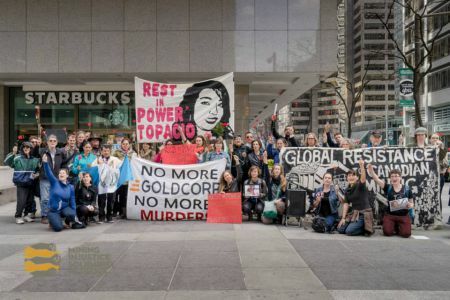 The march began with the crowd gathering at Goldcorp’s Toronto office on 130 Adelaide Street for a memorial for Topacio Reynoso Pacheco. 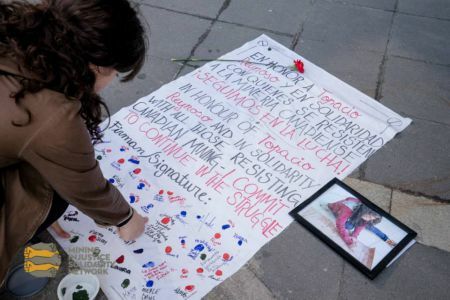 This 16 year old mining resistance activist was murdered a year ago for her resistance to the Escobal mining project, jointly owned by Goldcorp and Tahoe Resources. The crowd left flowers and candles on Goldcorp’s front steps in commemoration of Topacio Reynoso Pacheco. This 16 year old mining resistance activist was murdered a year ago for her resistance to the Escobal mining project, jointly owned by Goldcorp and Tahoe Resources. 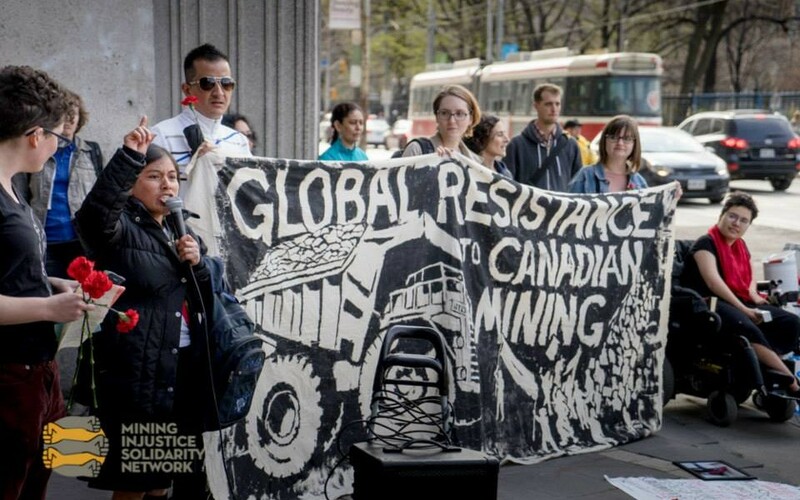 The communities surrounding the 10 year old Marlin mine have experienced ongoing human rights violations for the last decade, a pattern repeated at Goldcorp’s other mines across the Americas. Sergio Campusano Villches, President of the Comunidad Agricola Diaguita Los Huasco Altinos, an Indigenous community in Chile resisting another Goldcorp’s mine, attended the Goldcorp AGM. Upon leaving, he addressed the crowd outside and explained: “Today was the third AGM in three days that I have attended where I spoke about the El Morro mine jointly owned by Goldcorp and Barrick Gold and consistently, the executives of these mining companies tell me that they want to help my community by bringing development. But we do not want them in our territory. We never asked them to come and help us.” Sergio’s community recently took Goldcorp to the Supreme Court of Chile and won, forcing Goldcorp to recognize the Diaguita Huasco Altinos as the true owners of the land. 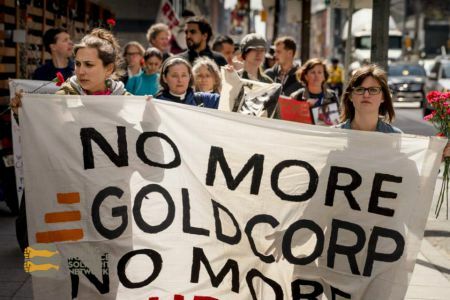 The crowd marched through Toronto’s Financial District to greet Goldcorp head executives and shareholders outside of Goldcorp Inc’s Shareholders Meeting held at the Sheraton Hotel. 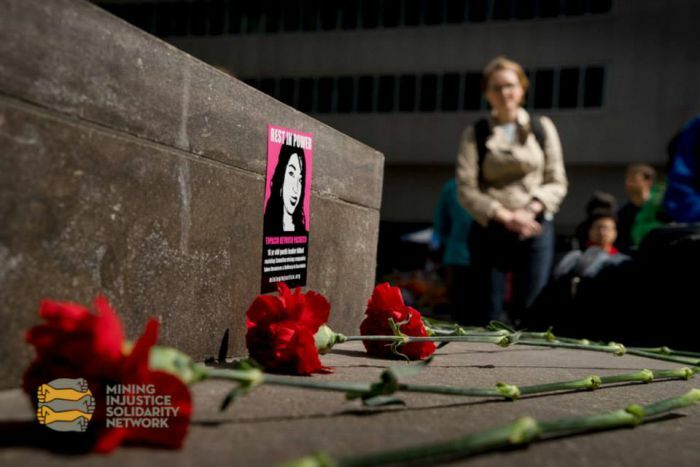 The march began with the crowd gathering at Goldcorp’s Toronto office on 130 Adelaide Street for a memorial for Topacio Reynoso Pacheco. 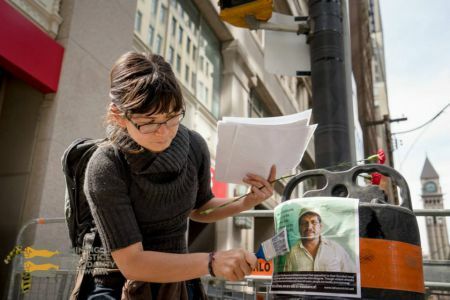 This 16 year old activist was murdered a year ago for her resistance to the Escobal mining project, jointly owned by Goldcorp and Tahoe Resources, a company founded by Goldcorp’s former CEO and 40% owned by Goldcorp. Topacio was assassinated by unknown gunmen on April 13th, 2014 in Mataquescuintla, Jalapa, Guatemala. Her father, Edwin Alexander Reynoso who accompanied her at the time, was also shot and suffered serious injuries. Both Topacio and her father were active in the resistance against Canadian company Tahoe Resources’ Escobal mine, in San Rafael las Flores, Santa Rosa. Topacio, along with her work as the Youth Coordinator of the Resistance in Mataquescuintla, was also a poet and musician. The memorial was held to honour the life of this youth leader and artist, and to denounce the violent and cowardly act that killed her. While marching, 15 different photo messages with quotes from community members impacted by Goldcorp/Tahoe’s Escobal mine were pasted across the Financial District. Following the memorial, to commemorate 10 years of resistance to the Marlin Mine in San Miguel Ixtahuacán and Sipakapa in the Western Highlands of Guatemala, and to express disgust and sadness at the ongoing repression, violence, and environmental destruction that is taking place at this mine as well as Goldcorp and Tahoe’s joint Escobal mine, the group marched with red carnations from Goldcorp’s headquarters at 130 Adelaide street to the location of Goldcorp’s Shareholder Meeting at the Sheraton hotel at 123 Queen Street West. As shareholders left the meeting, the group heard from many speakers, and denounced Goldcorp, for criminalizing and intimidating communities when they stand up for their rights and for their countless acts of human rights violations and lack of concern for the communities and people impacted by their mines. ← UPDATE: Evict Imperial: Stand With Secwepemc Women Warriors Society!